This document of a sound installation created in memory of the late Pauline Oliveros delivers the opposite of closure. As it proceeds, the lulling ambience is overtaken by the harsh slashes of what might be a violin, or a knife against rough leather for that matter. In retrospect — that is, upon subsequent listens — those string-like noises toward the end help reveal the source of the held tones at the track’s opening, the higher-pitch notes amid the general fog-horn drones. The violin is a constant presence, as it turns out, even though some time must pass before its presence becomes clear. The installation was created by the Vienna-born Mia Zabelka at the behest of the Austrian Cultural Forum New York (acfny.org). Pauline Oliveros, a maverick composer and sound theorist, was a practitioner of Deep Listening. So listen deep, put yourself inside Zabelka’s installation, and observe as her violin gains substance. Track originally posted at soundcloud.com/miazabelkamusic. More from Zabelka at miazabelka.com and twitter.com/miazabelka. Interpret a work of contemporary art as a graphically notated score. This project’s deadline is 11:59pm wherever you are on Monday, May 1, 2017. This project was posted in the mid-afternoon, California time, on Thursday, April 27, 2017. The Assignment: Interpret a work of contemporary art as a graphically notated score. Step 1: The image at the following URL is a photograph of Jingle, a 1980 work by the artist Kim MacConnel (b. 1946). The piece, which is approximately 8 feet wide and is made of acrylic on cotton, hangs at the Parrish Art Museum in the town of Watermill, New York, on the east end of Long Island. Step 2: Compose a short piece of music that interprets MacConnel’s Jingle as a graphically notated score. Step 1: If you hosting platform allows for tags, be sure to include the project tag “disquiet0278” (no spaces) in the name of your track. If you’re posting on SoundCloud in particular, this is essential to my locating the tracks and creating a playlist of them. Deadline: This project’s deadline is 11:59pm wherever you are on Monday, May 1, 2017. This project was posted in the mid-afternoon, California time, on Thursday, April 27, 2017. Title/Tag: When posting your track, please include “disquiet0278” in the title of the track, and where applicable (on SoundCloud, for example) as a tag. 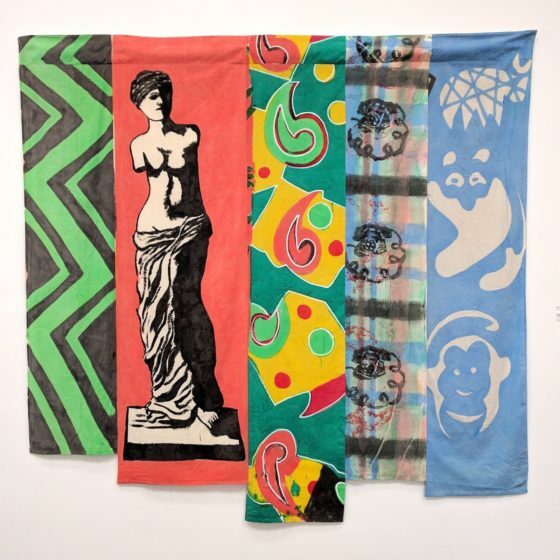 Image associated with this project is a photo of Kim MacConnel’s Jingle, a 1980 work for acrylic on cotton, shot at the Parrish Art Museum in Water Mill, New York, on the east end of Long Island. Consumer Products: CES is happening in Las Vegas, where battle lines are being drawn and allegiances formed amid various platforms, with Amazon’s Alexa in a prominent position (zdnet.com). Godfather Returns: Brian Eno has released a great new ambient album, Reflection, and a quizzically expensive iOS app (brian-eno.net). DJ Revisionism: And as Jonathan Soble writes in the New York Times, a relaunched Technics turntable is peculiarly detached from its hip-hop legacy (nytimes.com). This first appeared, in slightly different form, in the January 3, 2017, edition of the free Disquiet “This Week in Sound”email newsletter: tinyletter.com/disquiet. “Philip Glass + Buddha Machine. Jan 2017.” That single line of news popped up on Philip Glass’ Facebook feed two evenings ago, and simultaneously on the news page of Glass’ website, philipglass.com, and then an hour or so later on Buddha Machine’s own Facebook page. What it means isn’t exactly clear. The base impression is there’s a forthcoming Buddha Machine featuring sounds from Philip Glass. Then again, it could be something richer still. Monolake, aka Berlin-based musician Robert Henke has, among others, done a full album of Buddha Machine remixes. Perhaps Glass has composed a piece with the Buddha Machine as an automaton collaborator. On the first device the only controls were on/off and switching between tracks. Later editions in the Buddha Machine line added the ability to change the pace, and thus the pitch, of the track. This would be one among the many celebrations of Philip Glass’ imminent 80th birthday. He was born on January 31, 1937. The third Buddha Machine, released in 2010, featured performances on the guqin string instrument by Wu Na å³å¨œ. And there was the Buddha Machine Secret Edition, produced for a French spa back in 2007 and 2008. In addition to the spa, there have been five official Buddha Machines. Glass is himself a gregarious composer whose numerous collaborations include work with Aphex Twin, R. Carlos Nakai, Richard Serra, Allen Ginsberg, Paul Simon, and Suzanne Vega. This layering of multiple Buddha Machines has made the device a favorite of musicians who engage in generative music, in compositions that change over time as the result of artfully calibrated systems. 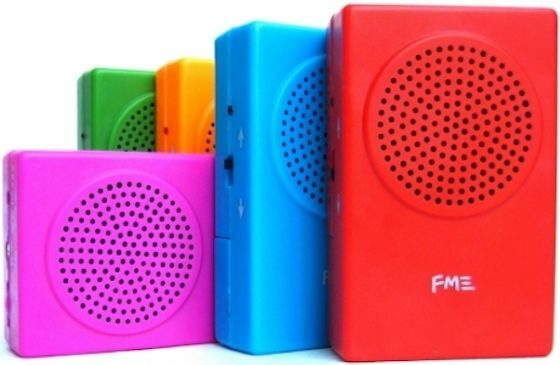 Among the earliest major proponents of the Buddha Machine was Brian Eno, who reportedly bought numerous of the first edition. Eno today announced this his forthcoming album, Reflection, due out on January 1, 2017, on the Warp label, will also be available as a generative iOS app (more at brian-eno.net) that he developed with Peter Chilvers. Eno’s previous generative music apps, also made with Chilvers, include Bloom and Scape. More on the Buddha Machine at fm3buddhamachine.com and buddhamachine.bandcamp.com. And, yes, there’s an iOS version. Update (2016.12.20): The device is now available for pre-order at bleep.com and boomkat.com. Bleep says, “Set for release on his 80th Birthday, the new machine features variations on piano, organ and voice, and is sure to be possibly the most minimal, yet hypnotic entry on the Buddha machine yet.” Boomkat says, ” brand new Buddha Machine made in collaboration with Philip Glass, released to commemorate his’ 80th Birthday on 31st January 2017. Seven loops of distinctive and hypnotic works by Philip Glass featuring piano, organ & voice. Significantly improved sound quality and built in speaker as well as headphone output.” There appears to be no pitch/speed control on this one.